With three Scott's Seafoods in town, the one at Loehmann's Plaza would be considered the 'old man'. I think this one has been there as long as I've been in Sacramento, which is at least 21 years. With the proliferation of sushi places on just about every corner, there are few true seafood restaurants around. And certainly even fewer of quality. Over the last two decades I have visited this site sporadically. Each time they have proven to be adept at the preparation of seafood and in bringing dishes with lots of flavor and flair. We went on a Thursday and the place was packed. Turns out they have some Thursday specials and give away some gift certificate prizes. They call it Shuck em and Shake em. So the oysters and certain mixed drinks are on sale. My first impressions were not so good service-wise. It was several minutes before I was acknowledged both at the bar and after we were seated at our table. But after we were situated, service became very friendly and engaging. The meal was very slow paced. This tends to be noticeable when you are so used to being hustled in and out of restaurants so quickly. But once you sit back and relax, you can appreciate that this is how fine dining is supposed to be. Take the time to enjoy and then digest each course. We first ordered the oyster sampler. I do not care for raw oysters, but I will eat cooked ones. The menu said we would get a Rockefeller, smoked, BBQ, and fried. When it arrived we were happy to see two raw ones as well. Those were perfect for my guest so that I grabbed the smoked and Rockefeller right away. Half of the oysters were large ones and a couple were small. Unfortunately the Rockefeller was a small and I love those. Love the garlic, cheese, and spinach all melted around the succulent oyster. The only disappointment on the plate was the BBQ one. It had pineappley sauce on it that I did not care for. Luckily it was small. We ordered a cup of the crab bisque to share. The waiter was nice enough to bring a taster out to my guest. It was a little mixture of the chowder and bisque mixed together. The crab bisque by itself was zesty. At first I didn't care for it. But as I ate more spoonfuls it really grew on me. It was thick and creamy and filled with spices. We both agreed, though, that we liked the mixed taster better. My camera phone doesn't do justice to the beautiful plating of our entrees. I chose the Jamaican Mahi with Coconut Prawns. There was a small mound of a rice pilaf topped with the Mahi. On top of that was a grilled avocado and salsa-type mix of mangos and veggies. 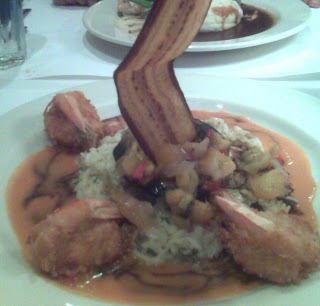 The sweet Creole sauce surrounded it and the three large prawns were butterflied, coated, and fried. That's a fried plantain slice topping it off. By this time I was already filling up and was afraid I wouldn't be able to finish off my entree. But the Mahi was the perfect size and I finished everything off quickly. I liked that the Mahi had a cilantro-lime marinade before they grilled it. I love the flavor of cilantro and it really accented the fish and sauce perfectly. 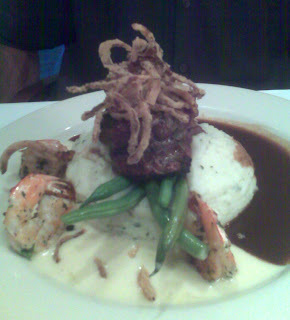 My guest chose the Filet Mignon and Prawns. Although a rather boring choice, you can see that the presentation was still artful and mouthwatering. The filet was perfectly cooked and sat upon a large mound of mashed potatoes and crisp green beans. One side had a garlic sauce for the shrimp and the other had the burgundy sauce. It had been a while since I had creme brulee, so that was my choice for dessert. Unfortunately this is was not a great ending. A good brulee is thick and creamy. This one was, for lack of a better word, very thick and pasty. OK. So they blew dessert. But everything else was outstanding. I'm really looking forward to trying the baby of the group - the one located at The Rivage on the river. Roli Roti: Pork - etta!